Atrial fibrillation (AF) is the most common type of irregular heart rhythm. In England a large number of individuals are unaware they have AF, and some people with known AF do not receive optimal treatment, resulting in avoidable strokes. AF-related strokes represent a significant burden to patients, carers, the NHS and social care. The AHSNs collectively identified that the spread and adoption of AF best practice across the AHSN Network could make a stepped improvement in care outcomes, leading to a reduction in AF-related strokes across England. Based on proven best practice across the AHSNs in recent years, 14 initiatives have been selected for spread and adoption through our national AF programme, supported by our community of practice of regional AF clinicians and managers to share learning and amplify impact. Spanning the AF clinical pathway, our national programme is drawing on this shared experience and intelligence to ‘detect, protect and perfect’. We are rapidly increasing the detection of AF through the use of manual pulse checks or mobile ECG devices. Early detection of AF will allow the initiation of protective anticoagulation therapy. We have distributed mobile electrocardiogram (ECG) units to GP practices, pharmacies and other community settings across Greater Manchester and Eastern Cheshire. This technology detects irregular heart rhythms quickly and easily, enabling NHS staff to refer patients for the appropriate follow-up and treatment. We are increasing anticoagulant therapy, in those diagnosed with AF and who are clinically indicated, to reduce the risk of stroke. We are optimising anticoagulation therapy in people newly diagnosed and those with existing AF. AF ambassador Wendy Westoby is encouraging everyone to learn more about AF after experiencing first-hand the devastation it can cause. Wendy, from Leigh, suffered an AF-related stroke in 2009 which affected her right side, movement and speech. “I left hospital after four weeks with a wheelchair and hardly able to put a sentence together,” she said. Wendy, aged 78, first noticed an issue with her heart around her 60th birthday but, despite many consultations with cardiologists, it wasn’t until her stroke that she was diagnosed with AF. Since diagnosis she has had several surgical procedures to pin-point the affected area of the heart and her AF is now controlled by medication. 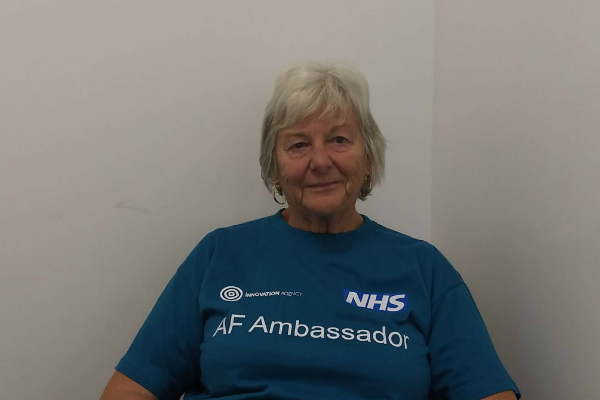 Although still recovering from her stroke, Wendy became an AF Ambassador with the Innovation Agency, the Academic Health Science Network for the North West Coast, and uses the AliveCor Kardia devices to test the pulses of people at health roadshows, community events and even her local walking group. Wendy, who is also a volunteer with the Stroke Association, said: “The test is very simple to do and I would recommend that if people are offered the chance to be tested for AF, whether in the community or through their GP, that they take up the offer. It could be lifesaving. “Being an ambassador keeps me occupied and it is very rewarding.